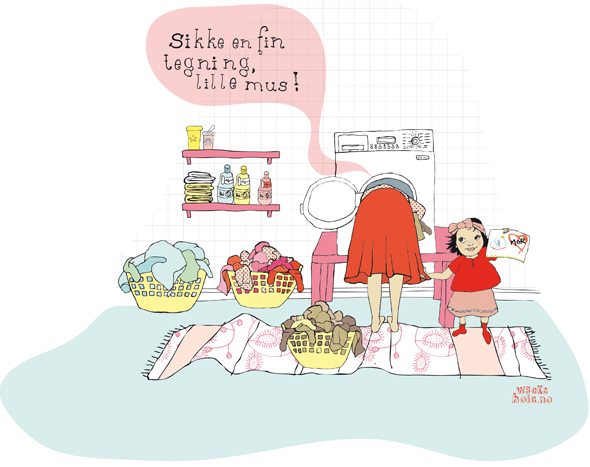 Vibekehoie.no: Busy moms! Recognize this situation? Busy moms! Recognize this situation? I do! (even though I wish I wouldn`t). This is an illustration I just did for the Danish magazine "Vores Børn". The article raises questions about how busy you are during the everyday rutines with the kids, and offer some advice on how to change. Do you prepare other stuff while the kids eat breakfast? Do you say "hmm" without really hearing what the little one is really saying? Are you present when you pick him up in kindergarden, or are your mind on "whats for dinner today"? How often are you online between 16-20.00? How busy are you when you put them to bed? Oh.... I think I wouldn`t recieve a topp score on this one...but right in the middle. Trying to squeeze in as much presence as I can!